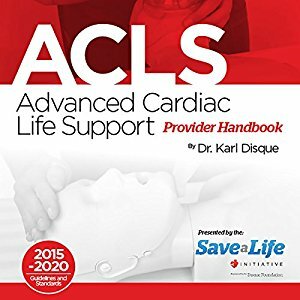 This Advanced Cardiac Life Support (ACLS) Provider Handbook and health care education course is a perfect study reference for first time ACLS certification or renewal. This provider handbook highlights the importance of high-performance team dynamics and communication, first aid, systems of care, recognition and intervention of cardiopulmonary arrest, immediate post-cardiac arrest, acute dysrhythmia, stroke, health care management and Acute Coronary Syndromes (ACS). This provider handbook details improvements in outcomes during complex cardiovascular, respiratory and other emergencies (e.g. metabolic, toxicological) by expanding on core ACLS guidelines and encouraging critical thinking and decision-making strategies. Through instruction and active participation in case-based scenarios, learners enhance their skills in the different diagnosis and treatment of pre-arrest, arrest and post-arrest patients. Our education training material is created and maintained by practicing physicians, adhering to the latest American Heart Association guidelines (2015-2020). This ACLS course for health care providers details health care law and ethics.